Guide to the Header Photos – small humans. science. The Yellow Kid, famous as the first American comic strip character, less famous as the first American licensed character. This particular action figure (avant la lettre, as they say in France and The New Yorker) found its way to a toy museum high up a medieval tower at the edge of the Marienplatz in Munich, Germany. It reminds us that children’s media have never been without merchandise, also that an object some dad once called a waste of allowance and a piece of crap can find its way onto the altar of history. The molded-in Emerson adds savor. A larger-than-life illusion of an illusionist and his confederate, suspended above the gates of RAI, the trade-show hall in Amsterdam, the Netherlands. The medium is the magic. 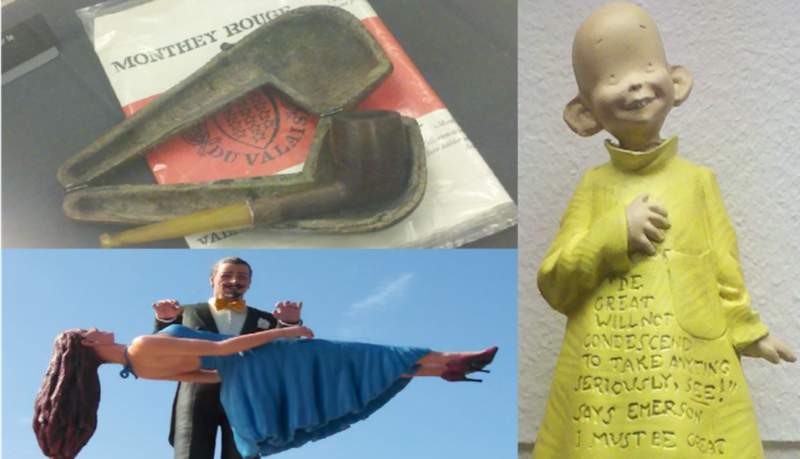 The pipe, case and long-gone-stale tobacco of Jean Piaget, father of developmental psychology, on view at the library of the University of Geneva, Switzerland.